For the past 15 years I have been living in an apartment that I loved in Hollywood. Until... Nicole Panucci on behalf of Moss and Company used her manager position to harass me and ultimately evicted me out of my apartment of 15 years. She made unfounded accusations based on irrational assumptions that I did not received and reacted well to. So she decided to force an inspection of my apartment that I declined her entry for. I tried to inform her that legally she does not have the authority to enter my apartment purely for the purpose of inspecting it because of what she wrongfully is assuming. Civil Code Section 1954 does not list “general inspections” as one of the reasons for entry by the landlord and Civil Code Section 1953 specifically prohibits any lease provision in which a tenant agrees to modify or waive any right or remedy under Section 1954. Miss Panucci may, however, enter my unit for the purpose of an inspection if it was connected to an improvement, repair, decoration, or some other service agreed upon or emergency building repairs, which was not the case. This attempt to enter my apartment without legal cause, or emergency just to check on the premises or on my activity is an infringement of my privacy and constitute harassment. Intentional violations of these entry provisions constitute interference with my quiet enjoyment of the premises and my privacy. Moss and Company failed to remind Miss Panucci that she may not abuse her right of access or use it to harass me and intentionally inflict emotional distress to a 15 years tenant. Instead Moss allowed and supported her to retaliate against me by handing me a 60 days’ notice of termination of tenancy. The premises apartment 404 located at 1807 N Las Palmas Avenue in Hollywood were vacated sadly on August 15 2016. After living in this apartment for 15 years and having no desire or intention to move, for no reasons I was forced out by Nicole Panucci, a Moss agent and building manager. Pursuant to Cal. Civ. Code 1950.5, Moss & Company was required by September 6 2016 to refund my security deposit of $1560 and/or provide an itemized statement listing any amounts Moss & Company has withheld. As of today, Wednesday December 7 2016, I have not received or picked up the refund of my security deposit. I have finally seen the statement listing all the amounts withheld and do not agree with 4 of the charges. First I would like to state that in August 2001 when we moved in, the building was not managed by Moss & Company. Nicole Panucci the incompetent & unavailable building manager did not do an initial walk through upon giving us the keys of the apartment and us moving in. The facts that the apartment was not cleaned and the shower doors not replaced by new ones were never acknowledged and provided to us after moving in despite both being promised to us. Cleaning/Janitorial charge for $165. The unit upon moving in was not clean like promised and after 15 years of living in the unit with no maintenance performed, I should not be charged $165 for cleaning. Paint charge for $150. In 15 years Moss refused to change the carpets and repaint the walls for 15 years. I rented this apartment for 15 years; during that time, the interior was never repainted. Normal wear and tear on the interior paint is to be expected. The fading and soiling of the paint is due to normal wear and tear. As such, the cost of repainting is Moss responsibility.​ Moss agent explain to me that it did not matter how long I have been living in my apartment, the walls were beyond normal wear and tear. Late fee charge for $25. I never paid the rent late, NEVER. Also Moss calculation for August rent owed is wrong. $924.92 amount Moss deducted should have been $895.16 (Rent 08/01 to 08/15 1850/31x15= 895.16.​ Moss only counts 30 days for the month of August because that is the way they do it. That is basically their explanation behind their fraudulent calculation. 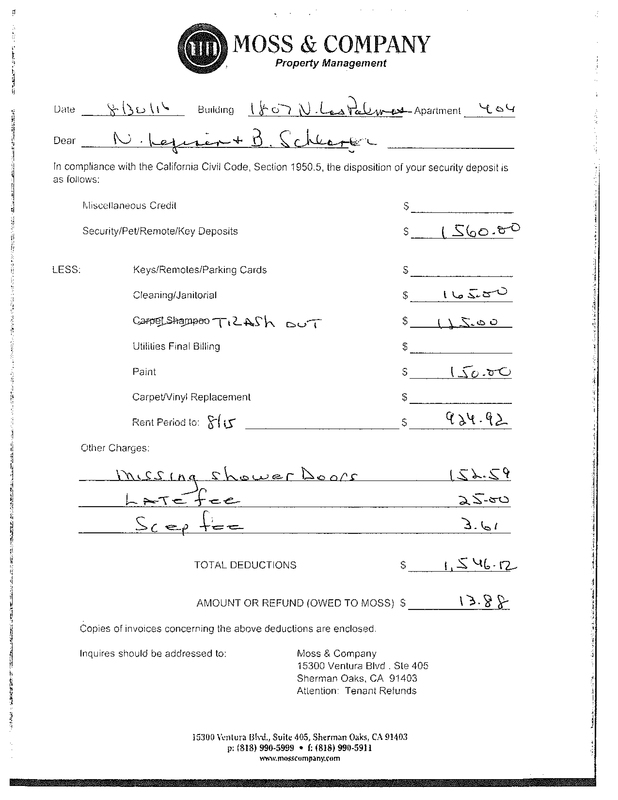 ​ According to Moss & Company, the refund of my security deposit of the amount of $1560 is $13.88, when it should be of $539.83. ​Moss and Company and their agent building manager Nicole Panucci made no effort to provide a full refund of my security deposit, or a statement of deductions and a refund of amounts not deducted, by the end of the 21-day period as required by law. The apartment was vacated on August 15 2016. According to a California Supreme Court decision, the landlord (Moss) loses the right to keep any of the security deposit and must return the entire deposit to me. Moss has ruined my life, turning it upside down by forcing me to move for no reasons, and now refusing to have the decency to refund an accurate amount of my security deposit in a timely manner. I have tried everything I could think of without success.